Mohandas Karamchand Gandhi was born on 2 October 1869 to a Hindu Modh Baniya family in Porbandar, then part of Kathiawar Agency, in British Indian Empire. His father Karamchand Uttamchand Gandhi worked as the diwan (chief minister) of Porbandar state. His mother Putlibai was Karamchand’s fourth wife. Mohandas had two elder half-sisters and three elder siblings. His mother was an extremely religious lady who had a great influence on the young Mohandas. However as he grew up, he developed a rebellious streak and defied many of his family norms. He started drinking alcohol and eating meat which were activities strictly prohibited in his traditional Hindu family. He was a mediocre student in school though he occasionally won prizes and scholarships. He passed the matriculation examination of the University of Bombay in 1887 and enrolled at the Samaldas College in Bhavnagar. In 1888, he received the opportunity to study law at the Inner Temple in London. Thus he left the Samaldas College and sailed to England in August. There he studied law and jurisprudence with the intention of becoming a barrister. While in England he was once again drawn towards his childhood values which he had renounced as a teenager. He became involved with the vegetarian movement and met members of the Theosophical Society who kindled his interest in religion. He completed his studies successfully and was called to the bar in June 1891. He then returned to India. He struggled professionally for the next two years before accepting a contract from Dada Abdulla & Co., an Indian firm, to a post in the Colony of Natal, South Africa, a part of the British Empire, in 1893. The years spent in South Africa proved to be a profound spiritual and political experience for Gandhi. There he witnessed situations he had no idea about previously. He, along with all the other colored people were subjected to rampant discrimination. Once he was asked to move from the first-class in a train in spite of having a valid ticket solely on the basis of his color, and another time he was asked to remove his turban. He refused both the times. These incidents angered him and kindled in him the spirit to fight for social justice. Even though his original job contract with Dada Abdulla & Co. was just for one year, he extended his stay in the country in order to fight for the rights of people of Indian descent. He spent over 20 years in the country during which he helped found the Natal Indian Congress which aimed at molding the Indian community of South Africa into a unified political force. Mohandas Gandhi had gained a reputation as a fearless civil rights activist while In South Africa. Gopal Krishna Gokhale, a senior leader of the Indian National Congress, asked Gandhi to return to India and join the others in India’s struggle for freedom. Gandhi returned to India in 1915. He joined the Indian National Congress and by 1920 established himself as a dominant figure in the Indian political scenario. He was a strict adherent to the principle of non-violence and believed that non-violent civil disobedience measures were the best means to protest against the British rule. He called for all the Indians to unite as one irrespective of the divisions of religion, caste and creed in the country’s fight for independence. He advocated non co-operation with British rule, which included a boycott of British goods in favor of Indian made products. He also called for the boycott of British educational institutions and prompted Indians to resign from government employment. He gave a speech launching the movement on August 8, 1942, calling for determined, but passive resistance. Even though the movement received massive support, he also faced criticism from both pro-British and anti-British political groups. He was criticized for his strict refusal to support Britain in World War II, as some felt that it was unethical to not support Britain in its struggle against Nazi Germany. Despite the criticism, Mahatma Gandhi remained steadfast in his adherence to the principle of non- violence and called on all Indians to maintain disciple in their struggle for ultimate freedom. Within hours of his powerful speech, Gandhi and the entire Congress Working Committee were arrested by the British. He was imprisoned for two years and released before the end of the war in May 1944. The Quit India Movement became the most forceful movement in the history of the Indian independence struggle and is believed to have played a major role in securing the independence of India in 1947. While the Indian National Congress and Gandhi called for the British to quit India, the Muslim League passed a resolution for them to divide and quit. 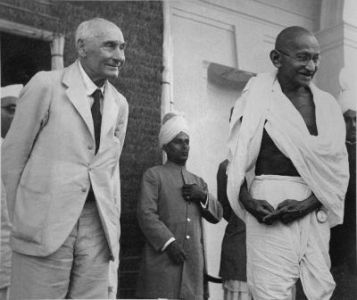 Gandhi was opposed to the concept of partition as it contradicted his vision of religious unity. Gandhi suggested that the Congress and Muslim League co-operate and attain independence under a provisional government, and decide about the question of partition later on. 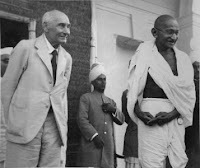 Gandhi was deeply troubled by the thought of partition and personally tried his best to unite Indians belonging to different religions and communities. When the Muslim League called for the Direct Action Day on 16 August 1946, it led to widespread riot and manslaughter between Hindus and Muslims in the city of Calcutta. Distraught, Gandhi personally visited the most riot-prone areas and tried to stop the massacres. In spite of his best efforts, the Direct Action Day marked the worst communal riots that British India had seen and set off a series of riots elsewhere in the country. When independence was finally achieved on 15 August 1947, it also saw the formation of the two new dominions of India and Pakistan following the Partition of India in which more than half a million lost their lives and 14 million Hindus, Sikhs and Muslims were displaced. Rabindranath Tagore, a great Indian polymath, accorded the title of “Mahatma” (meaning “high- souled" or “venerable" in Sanskrit), to Mohandas Karamchand Gandhi.